A very special country manor house, superbly designed and presented, for the very best of days. Sleeps up to 38 in 19 bedrooms with 16 bathrooms. Weekends from £9,000 to £15,000, full weeks from £10,000 to £20,000. For shorter stays please enquire. 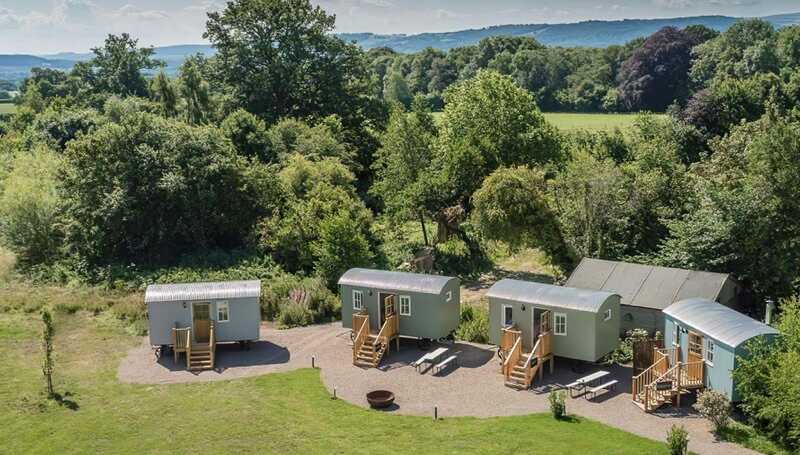 If fully occupied, price per person per night is usually between £38 and £132. A beautiful country manor house, designed specifically to host the most special of wedding days. Seats up to 120 indoors and the total venue capacity is 200. Lemore Manor originally dates from the 1600's, though extensive additions were built to the house in the 1800's, including a coach house and organgery. Lemore Manor is a romantic house; light-filled and warm. There are 15 bedrooms within the main house (12 of which are en-suite – there are a further 2 bathrooms), then the Lemore Lodges. 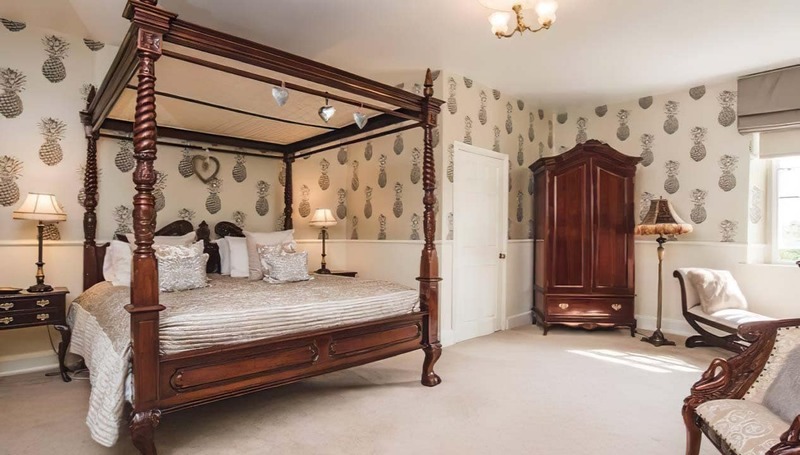 Each is en-suite, and they add an extra 8 single beds, providing room for up to 38 guests to stay at Lemore Manor. Oozing character, the property still retains many of its original features, but its country charm is matched by an elegant and contemporary décor throughout. 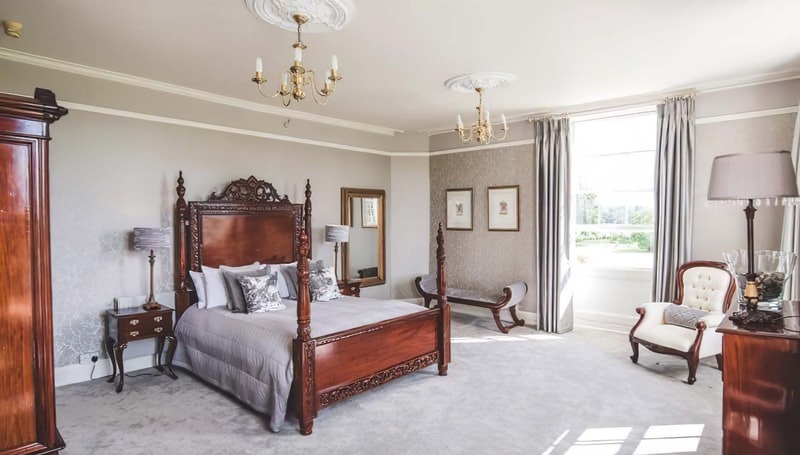 Alongside the gardens, take a little time to savour the detail of the splendid drawing rooms, dining room, garden room and basement entertainment rooms, whether you are seeking quiet contemplation or to join in the fun with family and friends. 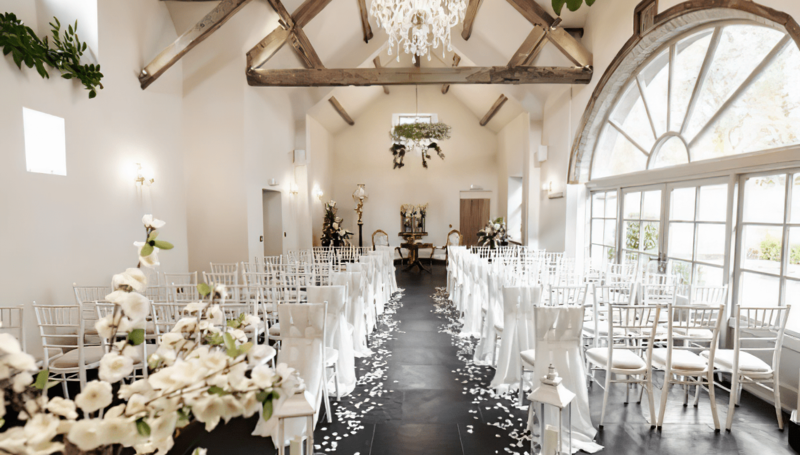 The beautiful Orangery is complemented by the historic Coach House, recently converted into a ceremony room and linked to the main house by a glass walkway. 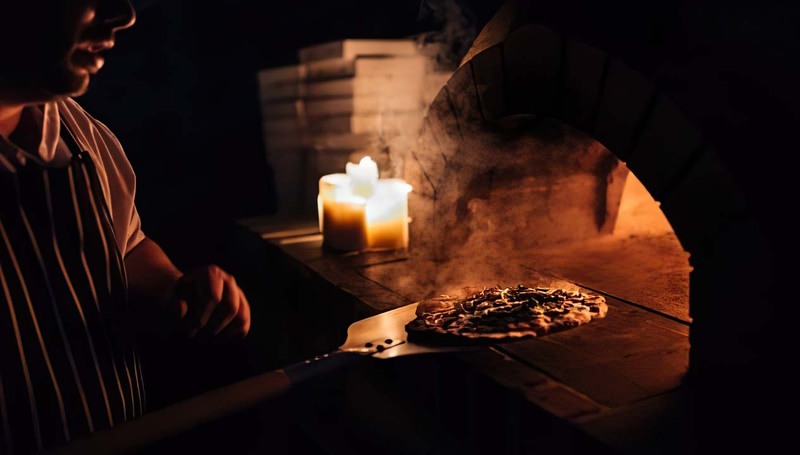 Surrounded by an intimate courtyard with its own ancient olive tree and clay pizza oven, this makes the perfect setting for unique and special events. Margaret and Ben came to Lemore in 2007 and have undertaken extensive renovation work since then. Every new guest is treated like a member of the family. 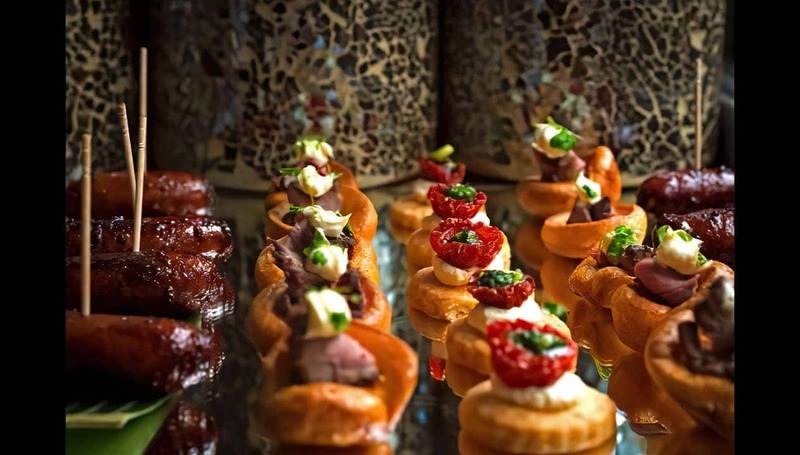 They are totally passionate about tailoring your day to exactly match your needs, making it the ultimate celebration, packed with unforgettable memories. Within the house itself, there is a drawing room, dining room, as well as the serene Garden Room and the country kitchen. There is also a lift to access the first and second floors. There’s a games room (with pool table and bar) in the Gentleman’s Retreat, there is also a ‘movie room’ that has a ceiling embedded with sparking lights; perfect for children and adults alike. The Manor boasts the most magnificent orangery, which seats up to 150 guests for a banquet or wedding breakfast and reception. Connected to the main house via a Glazed Link is the Coach House, which has been designed as a great open and flexible space, perfect for a wedding ceremony, or lecture (like the Orangery, it seats up to 150 guests). The gardens at Lemore are very gorgeous, lots of sweeping lawn and topiary. Thoughtfully-placed benches abound, with views of the Herefordshire countryside. Nestled in the trees is a delightful little area with its own Secret Garden called ‘The Hen House’. 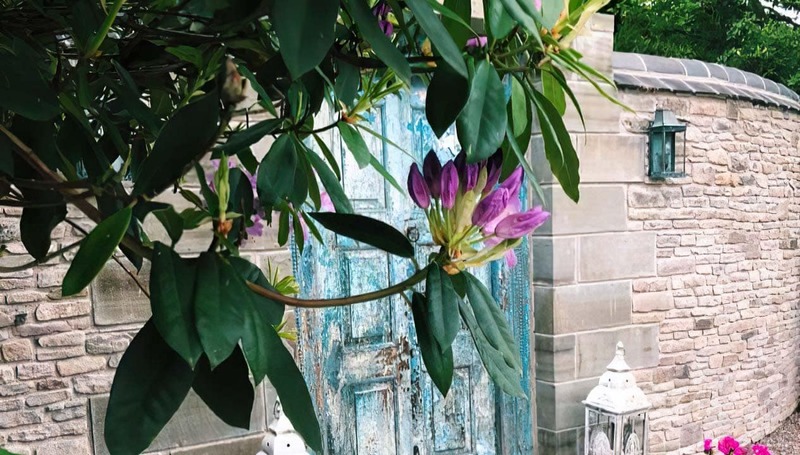 This is where brides can get ready for their day in complete privacy. It has a hot tub and a zillion mirrors. The French styled bandstand is licensed for a wedding ceremony, just off the main terrace. 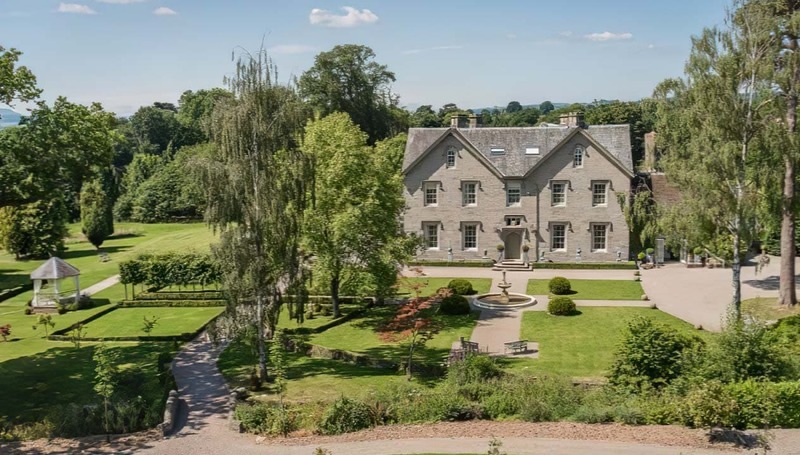 Surrounded by rolling countryside and nestled within 11 acres of beautifully manicured, landscaped gardens, this breathtaking country Manor is rich in history combining traditional architecture with a modern twist. 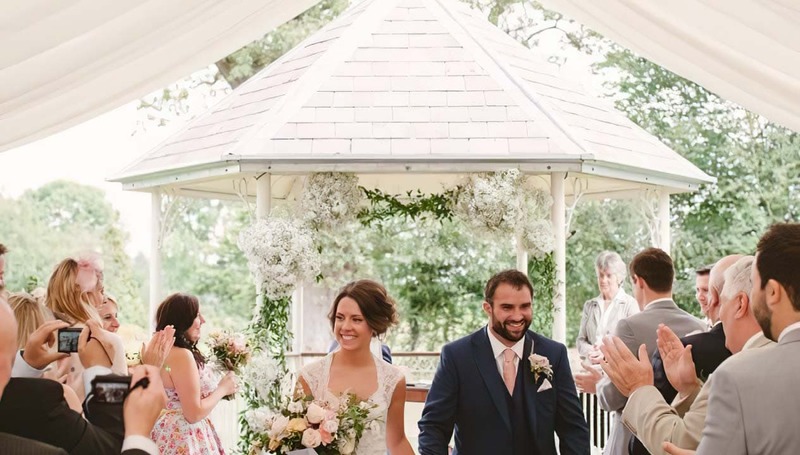 Bordering the Brecon Beacons and within easy reach of the main motorway networks, Lemore Manor boasts exceptional spaces, both stylish and versatile, for your ceremony, reception and wedding breakfast. The Manor is about three hours’ drive from London, and the nearest airports are Birmingham, Cardiff and Bristol. The nearest train stations are Hereford and Leominster. Do contact the house if you’d like help with the transport side of things. 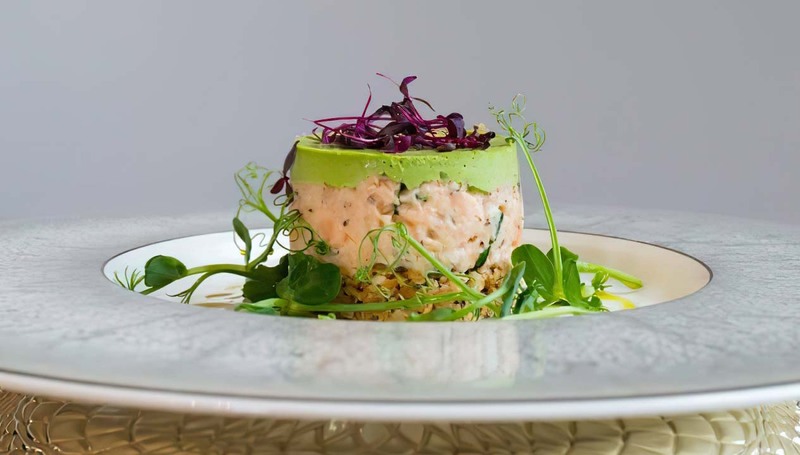 If you can tear yourself away from the loveliness of the Manor, the estate comprises of 11 acres, offering lots of on-site activities, both formal and informal, from Segway races on the lawns to archery, golf and clay-pigeon shooting. For corporate guests, there are more idiosyncratic activities, such as duck-herding (quite! ), and paintballing close by. 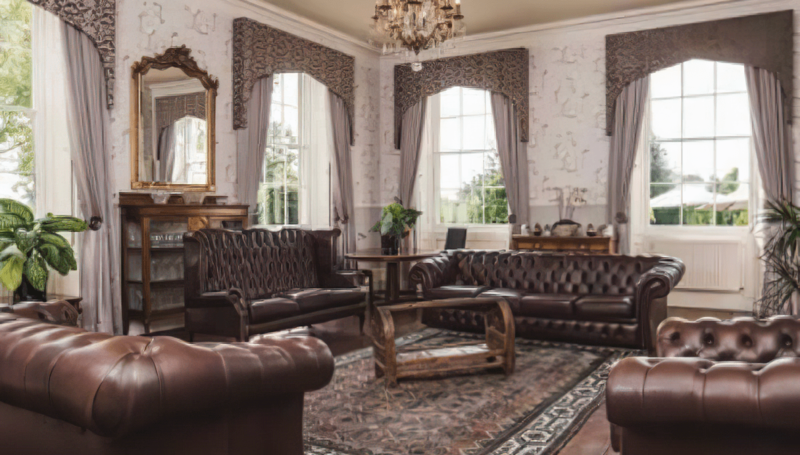 The Manor has a great team at the helm and will work with you to design the best corporate stay you can imagine. Lemore Manor couldn’t be a more perfect wedding venue. It holds a license for three different locations for the ceremony, then gives lots of options for the subsequent party. An indoor wedding could include 150 guests, an outdoor one, up to 200. Less formal weddings are available too, with a relaxed atmosphere and your very own street food stalls; just ask for details. For more details, please view the brochure. My wife and I got married on 6th April 2019. Lemore Manor is an absolutely breathtaking venue, the team are incredible, always there to help you and deal with any enquiries you may have. Diane was our wedding planner on the later stages of our wedding, and she was amazing. The food; the food is some of the best we have ever tried. We had 80 guests there for the day, and they complimented the food as well. You have two choices where to get married here, we chose The Coach House, as it's just so beautiful. The gentleman's lounge is good fun too for before and after the ceremony. If you're looking for a wedding venue, look no further than Lemore Manor. We only looked at Lemore Manor, we fell in love with the place instantly. Couldn't recommenced it enough. Held our beautiful small wedding at Lemore, Margaret and the team couldn’t have been more helpful and accommodating. Five stars ⭐️ ⭐️ ⭐️ ⭐️ ⭐️ We have just had our wedding at Lemore Manor and after looking at a few venues in January Lemore was the stand out from the crowd and my did this not disappoint. We had the most magical day and received such wonderful feedback from family and friends on the venue, food and service which was impeccable . The Manor is run by people who generally care and take pride in what they do. A special mention to Ceri who was absolutely fantastic with attention to detail second to none and nothing was ever too much trouble for her. Also Margaret who makes you feel so welcome and valued from the moment you agree to make Lemore your venue to the hug at the end when you are leaving, she is a wonderful lady who takes pride in her business and her customers. Service is personal and second to none. If you are looking for the perfect wedding in a fantastic setting with a team that are personal, caring and professional please don’t delay and book. You won’t be disappointed. Myself and my wife will be back soon for afternoon tea so we can relive our wonderful day again. Thank you Lemore for giving us the most wonderful wedding day. Thank You! Margaret, Ceri and the entire team at Lemore made our Wedding weekend just perfect! The venue is amazing, the food was just excellent, people didn't stop complimenting the beef! and of course the staff, what a great team! Simply can't speak highly enough of the whole experience from our first visit, the attention to detail, the help and support, nothing was ever too much trouble and everything was done to perfection. Thank you again, and looking forward to a reunion event in the future! A beautiful place. With an array of magical, enchanting features throughout. With a fantastic team looking after you from beginning to end. Thank you so much. See you soon again. We had our wedding at Lemore Manor on 27th May 2018, and we had the most wonderful day. We fell in love with Lemore two years previously in 2016, and our day was definitely worth the wait. We were a little nervous to wake up to torrential rain on the morning of our wedding, but we needn't have worried as we had the most amazing day (and the sun came out straight after the ceremony!) Margaret was such a huge help in the morning, from escorting us into the house to ensure we didn't get too wet, to helping dry my Mum's jacket and nothing was too much trouble. She was very calming, which helped the whole bridal party! Ceri was our wedding co-ordinator who was great, from the planning process where she answered my many questions and was so efficient on the day. So many people told me how they were impressed with Ceri and how she helped with any enquiries they had. Everyone told us what a beautiful venue we had, and everyone commented on how amazing the staff were and of course the food! Everyone said it was amazing food and how great the service was. We didn't need to worry about anything on the day, and everyone had a great time. The most perfect venue, and we are so happy that we had our wedding here! Thank you once again to Lemore, Ceri, Margaret, and all the other staff who made our day so special! Every mother dreams of a fairy tale wedding for her daughter, I would like to thank you Margaret, Jessica and your whole team at Lemore Manor for making my dream a reality! 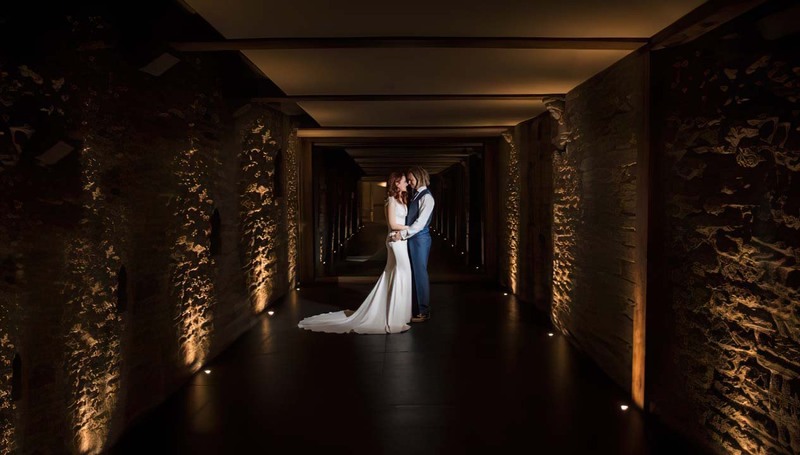 Emily and Dave's wedding day was perfect from beginning to end, Lemore Manor is a beautiful venue, the food Cooked by Mickey was absolutely amazing and the whole staff all gave the most friendly and exceptional service. So I would just like to thank you once again for what truly was the most perfect day! Would like to say a huge thank you to Margaret and the team for making our pamper afternoon a very memorable and wonderful experience. We were truly treated like ladies of the manor! Afternoon tea was a delicious feast and I was even able to enjoy the gin, after Margaret suggested having orange juice instead of tonic�. The hot tub was the perfect place to unwind and relax when we were not enjoying the beauty tips and treatments from Hilary. When darkness fell we all sat around the fire pit enjoying the marshmallows and sparklers. The secret garden is delightful and is a lovely addition to an already stunning location. Once again thank you. Absolutely love Lemore Manor ! We got married here in December and we couldn't be happier with how the day went. Jessica was amazing and spent a lot of time helping us plan and giving us ideas & responding to us on email. The food was amazing, great friendly service and a stunning venue. Everyone also commented on how great food staff and venue were. They also have wonderful suppliers within the area who were all amazingly helpful. I would highly recommend Lemore Manor and we cannot wait to come back for one of the event nights ! Soraya & Nic. Had a brilliant night here for our work Christmas party at Cirque Du Lemore! Amazing venue and great staff. Margaret and Ben are fantastic people and we can't wait to see what they do next Christmas. Mickey's food was delicious as always too! Ben even pulled us out of the snow in his tractor the next day!! Awesome venue, awesome night and awesome owners. The new WiFi is top notch too �! Lemore Manor..lets find one word to describe how the whole team at Lemore made us feel, how our day went and how the whole "Lemore experience" was for us a few weeks ago... Perfect Absolutely perfect..we couldn't have wished for a better day. From when we first booked our wedding with Margaret and the team, we knew that we would be looked after, that the organisation and planning of the day was in the best hands and that everything would be amazing.. and , it was. Having worked with Mickey the chef in a past life, i knew how good his food was, but he really surpassed himself for the meals - every guest commented how great the food was. Every guest commented how beautiful the venue was, every guest commented how well the day ran and every guest had an amazing time and we couldn't have wished for more. Our wedding day was about me and my new husband becoming a unit for our little family - the ceremony did just that. The rest of the day was for our family and friends and to celebrate how much they all mean to us and thanks to Lemore we were able to make that dream a reality. I couldn't find a better venue - if you are thinking of booking a wedding or any other event here - do it! you will not be disappointed. We had an incredible wedding here just over a month ago. Margaret and her team made sure the day ran seamlessly and we're always quick to answer our questions and find a solution. The venue is so gorgeous and the food is delicious! Overall lemore manor gave us the best wedding day we could have hoped for, we would highly recommend it! Ken and I married at Lemore Manor on 16 September 2017. We stayed from the Friday to Sunday and had a fantastic weekend. Aine looked after us and did an incredible job, she worked so hard and very long hours ensuring that every need and timeline was met, I cannot thank her enough. 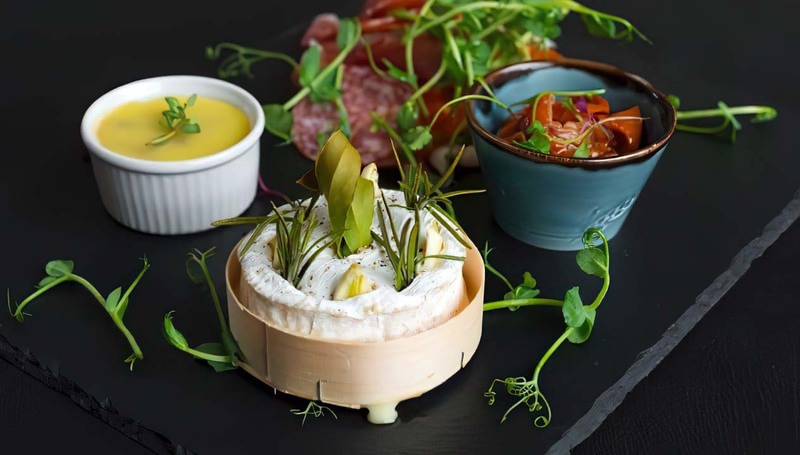 Lemore delivers pure perfection in location, hospitality, food, beautiful rooms and attention to detail. As we are a mature couple our family aged from 7 yrs old upto 90 yrs old they were all looked after. Thankyou Lemore and your lovely staff for making our weekend perfect. I just want to thank Margaret and the team at Lemore Manor for organising such a fantastic wedding which I attended over the bank holiday weekend. 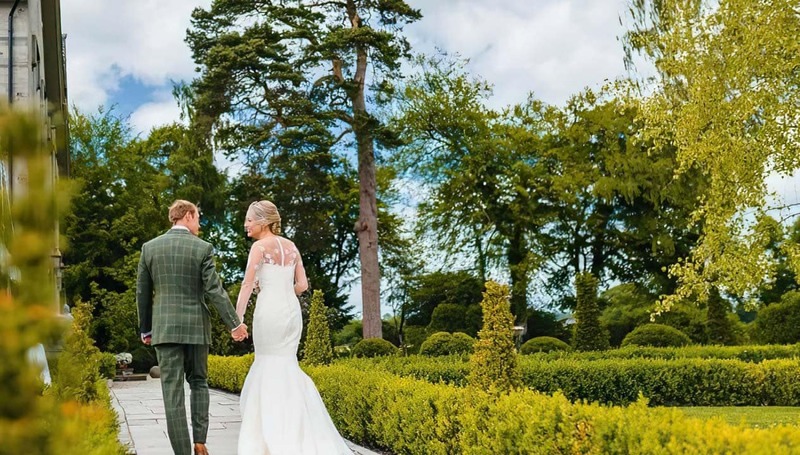 The location is stunning, a beautiful Manor House with amazing grounds set just outside the picturesque village of Eardisley, a perfect setting offering endless photo opportunities. The Chef and his team did a fantastic job and all the guests were overwhelmed by the quality of the food and amazing service. A special mention must also go to Margaret and her team as the attentive service throughout the entire day was exemplary and the high level of service was maintained until the party finished in the early hours. 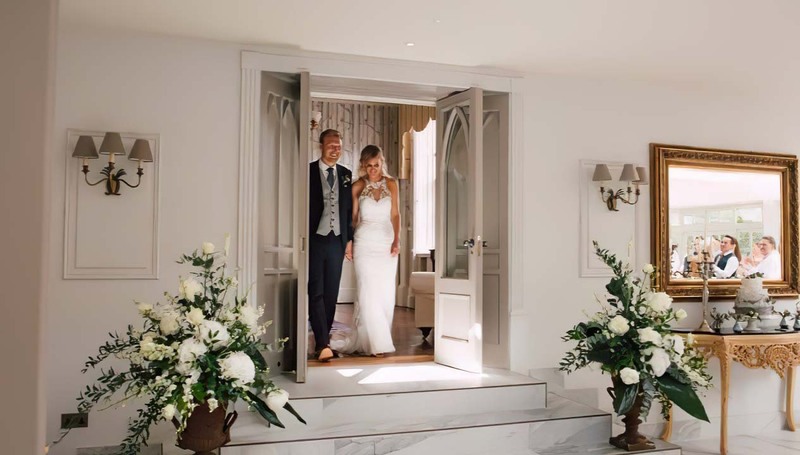 Some of the wedding guests stayed overnight in the Manor and the standard of rooms are the epitome of pure luxury – I found them to be spacious, well-appointed and extremely comfortable. 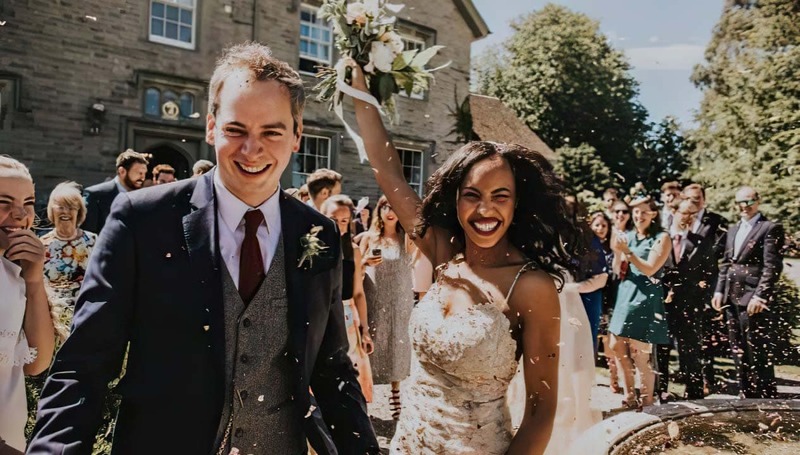 All of the guests without exception said that the wedding was a fabulous day, from the ceremony itself, the amazing food and service and the party in the evening, all within the most perfect location. For me, it was the best day ever; Margaret even arranged for the sun to shine (believe me, she is that organised!!) and I cannot thank you all enough for making it such an enjoyable wedding. Thanks for helping to make our wedding extra special! Our wedding weekend went so smoothly thanks to all the friendly helpful staff at Lemore. Micky did an amazing job with the food which everyone loved, and the extra touches on the day such as the team decorating our 'cheese cake' for us made all the difference. The girls enjoyed getting ready in the lovely Hen House, and the boys appreciated having the space outside for a pre-wedding cricket match. After attending a friends wedding here I thought staff where rude (apart from bar staff) they looked miserable, food service was disorganised. Food taken away before we had finished or had chance to eat it! Very long spells between courses! Drinks very over priced. Bottle bar only. I could go on! Only thing going is the lovely setting. I would never recommend this venue to any bride to be!!! I’m a very disappointed Lemore bride. I got married at Lemore Manor in March 2017. Whilst the day itself was enjoyable, during my stay, my diamond earrings went missing from my bedroom. After a thorough search, on 31st March prior to departure, I notified staff that my earrings were missing. They said they were sure they would show up. They didn’t. I filed a theft incident report with the local police. Lemore Manor will not support a claim against their insurance without evidence of the theft. I cannot evidence it without: a) Signs of forced entry to my bedroom – Note. Lemore Manor do not provide locks and keys on guest bedroom doors; or, b) CCTV proof – Note. Lemore Manor do not have a CCTV security system; or, c) A witness to the theft I would have thought that at a minimum, Lemore Manor should provide guests with either the ability to lock their rooms, or a room or hotel safe to store valuables. Lemore Manor denied any possibility that their staff or contractors could have stolen my earrings stating ‘they do not steal.’ End of story as far as they appear concerned. Lemore Manor have been extremely uncooperative. They take no responsibility for my missing earrings. I would expect that this kind of accommodation would have a duty of care to protect their guest’s valuables. For anyone considering a wedding at Lemore Manor, a word of warning, don’t take your valuables! If they go missing, Lemore Manor could simply say that you ‘lost’ them OR that your guests were responsible for the theft. And like me, without evidence to the contrary, you won’t have a leg to stand on! I had the pleasure of winning the Quintessential Afternoon Tea and it was perfect. From our welcome and being shown around to the hen house, hot tub and the afternoon tea....everything was lovely, had a relaxing afternoon with fabulous friends and would love to do it all again!!! Such an amazing vanue. Had a lovely time on Mr Fitzclarks wedding this weekend. Beautiful place. Wonderful weekend for Daniel and Alan's wedding. Couldn't have been more perfect. Compliments to the chef, the food was amazing. We had an amazing weekend for Daniel and Alans wedding it was perfect and such a beautiful venue. Amazing. The best wedding venue you could ever wish for. We had our wedding here just before Christmas and our guests are still raving about this gorgeous venue. The staff are very well trained and professional. The food was mouth watering and up to an exceptional standard (props to their chef)! Margaret did an excellent job in handling the day for me and easing my last minute anxieties. I'd like to give it 5 stars but we did have a few bumps post wedding and some slight miscommunication issues, special thanks to Sadie for helping us with this! My advice when communicating with the venue would be to call first as some staff aren't always very good at communicating via email. However, having said that I would still definitely recommend this venue to every couple looking to have a countryside wedding! It's a venue everyone will love! Lemore Manor was a beautiful venue for our friends wedding last weekend. Excellent service too. Fantastic team building day. Thanks to Margaret (and Ben) and the staff for great food and excellent venue for the varied activities. amazing place tucked away off the beaten track in a glorious part of Herefordshire ...very lovely staff..
Photogenic venue; great atmosphere; recommended food. We had a lovely family celebration weekend in August 2015 despite Margaret's antics in the run up. I had my 70th birthday party at Lemore Manor, Brilliant, the sun shone, the food was delicious and Margaret and Ben made us so welcome, they made it a very special day for me to remember. The people make the occasion, but it's then enhanced by a perfect setting and quality facilities. Well done everyone at Lemore! Excellent venue where we enjoyed our wedding week. Lots of activities to do in the area. The day ran amazing with Margaret, Ben and the team. Food was also exceptional. See you in the future for an anniversary! Stunning house & area. Lovely staff. Sad that I didn't explore the surrounding countryside a bit more while I was there. Cannot fault Lemore, Margaret and Ben. We had our wedding here last June and last minute as we were let down by our original plans and i am glad we were, it was perfect and just what we wanted, if i could go back every year and do it again i would. Cannot thank you enough for your support and help. The location, accomodation and food are all stunning and they have the most comfortable mattresses i know! !